This lithograph was made from plate 9 of 'Afghaunistan' by Lieutenant James Rattray. In September 1841, Rattray received a note from the British Political Agent in Kabul, Alexander Burnes, asking him to prepare for the visit of Atmaram, the prime minister of Mir Murad Beg and ruler of Kunduz. Originally from Peshawar, Atmaram was a Hindu of humble origins who had risen to Dewan Beg of Kunduz by talent and skill. Also in his favour was his ability to read and write, in an age when most Uzbegs were illiterate. Splendidly attired in Uzbeg style (he was the first Hindu permitted to sport turban and cummerbund), he retained his red Hindu caste mark on his forehead. He had on many occasions used his influence with Murad Beg to save Burnes and other British officials from death or imprisonment on their travels. 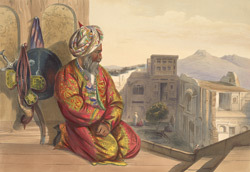 Rattray wrote of Atmaram as "a sly-looking old fellow, countenance beaming with cunning and intellectual fire", and noted that he had "never betrayed his master's trust".